Olympia Dukakis wrote an opinion article for CNN on treating home care workers well. As the need for in-home caregivers expands exponentially across the United States, private duty home care agencies need to consider ways to attract and retain employees who will help our elderly age in place. There are at least 2 million home-care aides in this country doing the important and difficult work of supporting families through the joys and challenges of aging -- and demand for these workers is expected to double by 2020. The Bureau of Labor Statistics projects that the No. 1 growing occupation in the next 10 years will be the in-home caregivers. These individuals -- overwhelmingly women -- so crucial to ensuring a high quality of life for our elderly relatives and friends are marginalized, disenfranchised, often denied basic protections and classified as a throwaway sector of low-wage work. It is no wonder that we lack the workforce to meet our nation's skyrocketing need for long-term care -- we don't care for them. Care workers fall into a unique category. They are Americans who support themselves by helping another family's loved ones, yet have to sacrifice their own care and that of their families. If we raise wages and offer attractive benefits, we provide economic opportunity on two fronts: lifting care workers out of poverty and giving sandwiched families the chance to develop and grow professionally themselves. Effective career training cannot take a backseat, either. If we can implement a thorough, strong and efficient training program for caregivers, we can create an occupation that helps all individuals struggling to make ends meet -- from the low-wage worker or immigrant searching for a career to the "sandwich generation" mother who had to give up her career to devote herself to the care of her children and her elderly parent. We also cannot forget that many immigrants work in America's burgeoning caregiving industry, young men and women who have come to the U.S. looking for opportunity and a pathway to citizenship. A care career could help them achieve their dream and make a critically important contribution to our country. Care workers are invaluable. We must provide for them in the same amount they provide our elderly, the same amount I gave to my mother and the same amount my own children will give to me. What do you think? 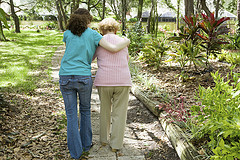 How do you recruit and retain the best caregivers?